The neighboring property to Sky Retreat has the only certified paragliding site and school in N.C.
Come enjoy watching the beautiful view of wings soaring in the sky. To fly this site,receive first time site orientation, and join the BRPC please call 704-907-6963. BRPC, (Blue Ridge Paragliding Club), is a local chapter of USHPA, (United States Hang Gliding and Paragliding Association). USHPA membership is required and by submitting my Annual or Visiting BRPC Application / Renewal, I agree to maintain USHPA membership in good standing when flying and or participating in BRPC activities. I affirm I have read in full and agree to the USHPA Association Liability Release that extends to BRPC as a local chapter. Please call 704-907-6963 to request your BRPC annual or visiting pilot daily membership and fill out the online site waiver. All membership dues go directly into maintaining the paragliding site (roads and parking lot, trash removal, launch grass maintenance/mowing, wind socks, chairs, etc), and club social events. Any membership dues that are left over are used to make donations to the LZ landowners for access road maintenance etc. to support good relationships and maintain permission to land. Must have a current P-2 or higher USHPA rating. Site orientation is required to fly this site. 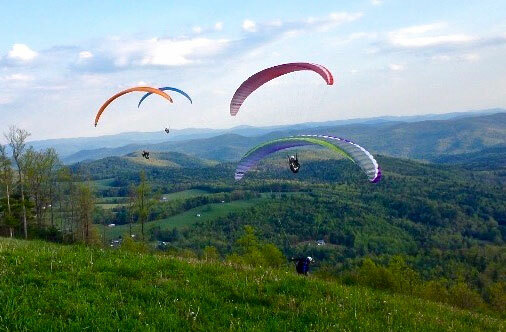 Non-member visiting paragliding pilots must be approved for a day-pass to fly and have the supervision of a Blue Ridge Paragliding Club member. Always clear traffic before taking off and entering the flight pattern. The main LZ to land in is called the 'Church Field' and is to the left of take-off. If landing at the LZ to the lower right of take-off, pilots must be quiet especially during hunting season. This includes no loud talking when coming into landing, packing up gear, etc. When landing at the lower right LZ, please pack up your gear and walk down the logging road/gravel drive at the back/North side of the field. Continue down this drive to the main street where you can be picked up. We have a good relationship with the LZ owners and we want to maintain this landing privilege by respecting their land and not disrupting their activities.